STROUDSBURG, Pa. (WPVI) -- A national fraternity was banned from Pennsylvania for 10 years and ordered to pay a fine of more than $110,000 as it was sentenced Monday for its role in the death of a 19-year-old pledge during a 2013 hazing ritual. 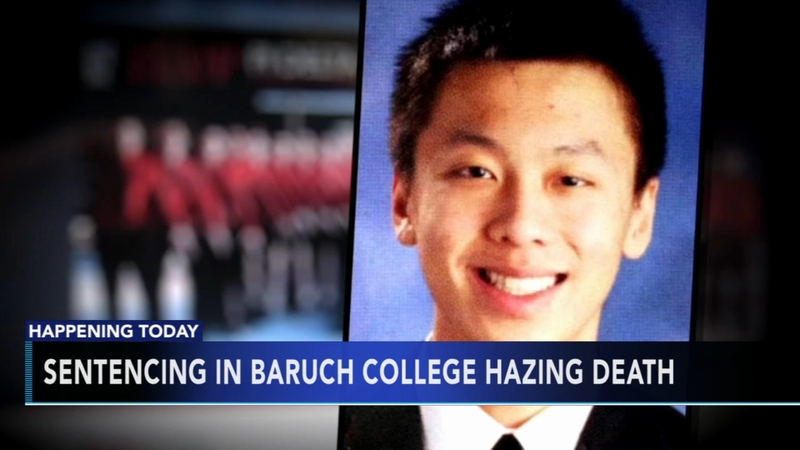 The judge and a prosecutor slammed Pi Delta Psi for calling itself a victim of rogue fraternity members, saying the organization tolerated and even encouraged hazing for years leading up to the death of Baruch College freshman Chun "Michael" Deng. "It's the epitome of a lack of acceptance of responsibility. It's their rituals and functions that led us here today," said Monroe County Assistant District Attorney Kim Metzger said in court. Pi Delta Psi, an Asian-American cultural fraternity founded in 1994, has 25 chapters in 11 states, including one at Penn State University that will now have to be disbanded. Four defendants who pleaded guilty to voluntary manslaughter and other charges will be sentenced later Monday. A grand jury said fraternity members at Baruch, a campus of the City University of New York, physically abused Deng, and then tried to cover it up as the 19-year-old lay dying in their rented house in the Pocono Mountains. Police charged 37 people with crimes ranging from aggravated assault to hazing to third-degree murder. Pi Delta Psi was convicted of involuntary manslaughter following a trial. In a written statement, Pi Delta Psi said its now-disbanded Baruch chapter had brought "shame and dishonor" to the national fraternity. The fraternity also called itself "in part a victim," which brought a rebuke from Monroe County President Judge Margherita Patti-Worthington. "I would never label the national fraternity as a 'victim,'" said the judge, who faulted the fraternity's board for allowing the hazing rituals to persist. Pi Delta Psi's attorney, Wes Niemoczynski, argued that the organization had developed a "no excuses" hazing policy before Deng's death, but he said the policy worked on an honor system and proved to be inadequate. The fraternity's "Crossing Over" initiation rituals "involved some physicality, but they certainly did not involve the level of physicality, the level of inhumanity, and the depravity of the individuals who are also coming before the court," he said.